Bobby is our hostess and she chose the word RAIN. and cut four clouds which I layered together for added dimension. my word dies and found the center of the b in celebrate was perfect! so that they were the same height as the cloud. Then I added Wink of Stella (clear) to the raindrops for a little sparkle! I can't wait to see what the code word inspires you to make! What a genius way to get those fabulous, sparkly raindrops, Doni. Love that sentiment. Perfect for this wonderful creation. How clever you are to hunt your stash for a makeshift raindrop die...and sparkly ones, too! Love it! Love your sweet card too, Doni! 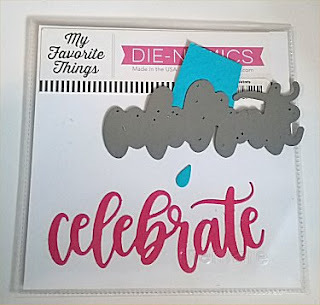 Wow...super creative way to make raindrops! Love it! 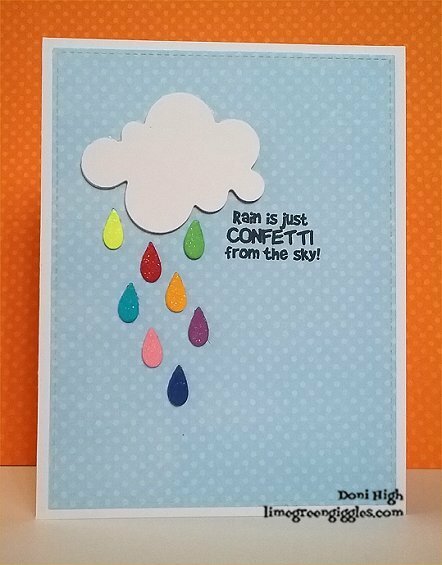 Fabulous card, love the rainbow rain. What a great card. Rainbow raindrops are perfect! I love that sentiment, Doni. Whose is it? 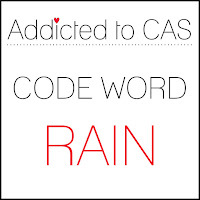 It goes so perfectly with the rainbow of raindrops, cleverly cut from a word die.